"You are a kite dancing in a hurricane, Mr Bond." Holy crap, this is badass! IMAX has debuted their new poster for James Bond's Spectre, starring Daniel Craig as Agent 007, directed by Sam Mendes. 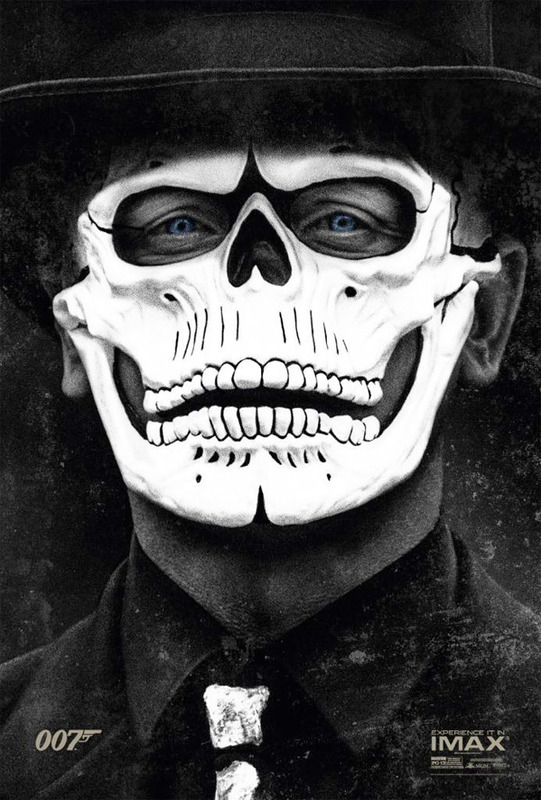 It's a bleak and bold skull mask painted in front of James Bond's face, connecting to the imagery we've seen in the trailers and on the other posters so far. I love how it's just right up there front and center, and the subtle blue tint in the eyes is just perfect. I don't care if Daniel Craig doesn't like playing Bond, this is still very cool, and it's just an ideal tease and tiny hint at the Spectre storyline. I can't wait to see this! Bring on Bond. Here's the IMAX poster for Sam Mendes' Spectre featuring Daniel Craig - arriving in theaters November. Spectre is directed by Sam Mendes (Skyfall, Revolutionary Road, Road to Perdition, American Beauty) and written by Neal Purvis & Robert Wave with John Logan, all with James Bond franchise experience. A cryptic message from Bond’s past sends him on a trail to uncover a sinister organisation, Spectre. While M battles political forces to keep the secret service alive, Bond peels back the layers of deceit to reveal the terrible truth behind Spectre. Daniel Craig returns as 007 along with Ralph Fiennes as the new M, Naomie Harris as Moneypenny, and Ben Whishaw as Q. New cast members include Christoph Waltz, Monica Bellucci, Dave Bautista and Lea Seydoux. Sony Pictures will release Spectre in theaters on November 6th, 2015 this fall. Badass poster but when the hell did Craig ever say he don't like playin James Bond? But WHERE did he say this at, tho? In a magazine interview, on a talk show, on Twitter? In a magazine, if I remember correctly. However, I believe his comments have been taken out of context. He said "I'd rather slit my wrists than do one right now (or something to that effect)" and people started reading too much into it. That's my opinion. Man people took his comment way outta context. Oh yeah. Especially when he clearly said he doesn't want to make another movie immediately. Or words to that effect.